Can someone identify this purplish discoloration in my Cherry Tomato leaves?? Is it not enough nitrogen? I think its important to add that all the discoloration is on the bottom part of the plant. The top leaves look good. Considering they are the bottom leaves and looking at the spots on them, I'd say that you may have septoria or early blight. 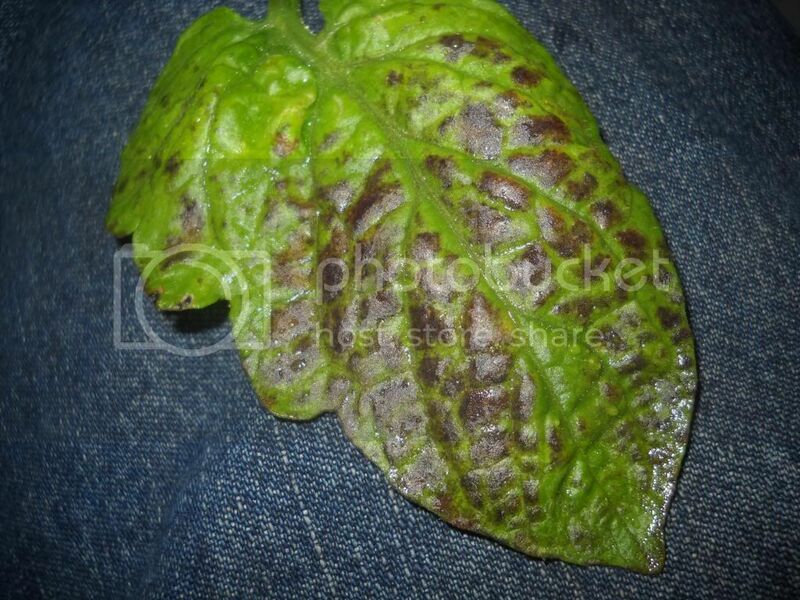 These are fungal diseases caused by dirt splashing up on leaves. Your best best is to pull the leaves and dispose of them far from the garden or compost. 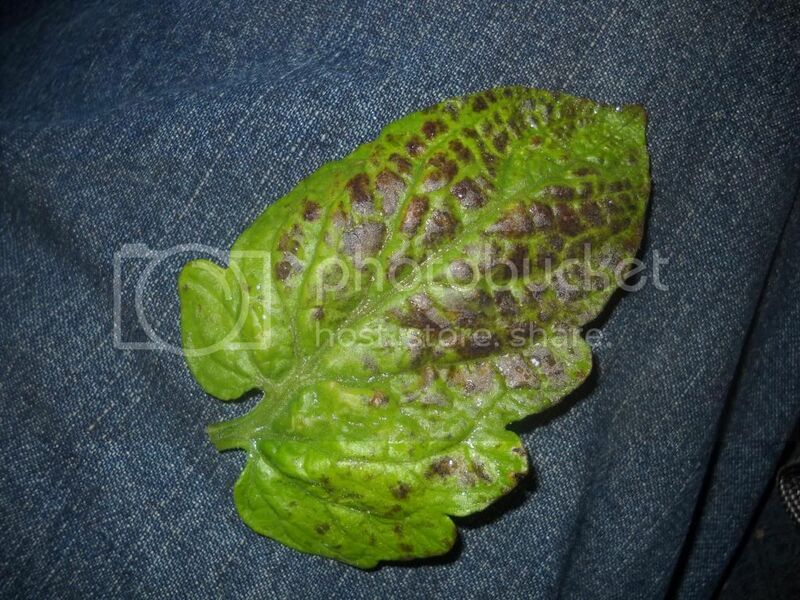 I'm not convinced re the septoria, though it would help to have a picture of the plant as well. But those leaves look very healthy, just discolored. But I seem to be a lot better on what it isn't, than what it is! Interveinal symptoms on older leaves are often related to one or a combination of nutritional deficiencies (manganese, magnesium, potassium, etc.) and hard to pinpoint. They are rare once the plant gets put into garden soil, but they could have started earlier (in seedling pots)and grown out to look nasty beacause the sick/dieing parts of the leaves doesn't heal but the living part can get better with a change in conditions. I have had nutrient deficient potted seedlings do something like that ending up with dark checkering because of high light, poor quality potting mix and me being slow to fertilize. Those early leaves tend to get taken off so I don't see it on larger plants. I have also seen that type of damage on fungal and spidermite infected leaves that were sprayed with this or that (including insecticidal soaps). The leaves looked good beforehand but were weak. The carrier oil or alcohol or active ingredient in the spray interacted with the damaged tissue to kill it. It could also be caused by spraying just about anything at the wrong time of day. TZ -OH6 wrote: Interveinal symptoms on older leaves are often related to one or a combination of nutritional deficiencies (manganese, magnesium, potassium, etc.) and hard to pinpoint. They are rare once the plant gets put into garden soil, but they could have started earlier (in seedling pots)and grown out to look nasty beacause the sick/dieing parts of the leaves doesn't heal but the living part can get better with a change in conditions. Whats a good time to spray my manure tea? I am a newbie at this, so you may want to take my thoughts with a grain of salt! However, I had the same thing showing up on some of my plants. ONLY on the cherry tomatoes I have planted in containers. And the only other tomato plant I have in a container (an amish paste) started showing other signs of stress around the same time -- specifically, it's leaves began to curl. I never did find anything similar (until this) with research, but it just seemed too regular of a pattern for a virus/fungus. However, I did discover that I probably wasn't fertilizing my container plants frequently enough. So I gave them some fertilizer, and the problem has not advanced any further for at least a week and a half. Hopefully, that was the solution? mom2cassie wrote: I am a newbie at this, so you may want to take my thoughts with a grain of salt! However, I had the same thing showing up on some of my plants. ONLY on the cherry tomatoes I have planted in containers. And the only other tomato plant I have in a container (an amish paste) started showing other signs of stress around the same time -- specifically, it's leaves began to curl. When spraying avoid high temps and high light (sometimes very cold temps too). A wilty leaf will react differently than a fully turgid leaf when something is put on it, and some of the chemicals do this or that at high temps. The package should say what conditions are most dangerous. Compost tea made with water shouldn't give you any trouble, but I would spray it in the early morning or evening because the longer it stays on the leaf as a liquid the more time the nutrients have to penetrate the leaves. It probably won't fix the discolored parts of leaves because that tissue is most likely dead but it may stop other leaves from discoloring. Make sure to get some down into the soil so the roots can take in the nutrients too. Foliar fertilization works, but not equally under all conditions. Roots are made for the job.